← Mother Dolores Hart Visits EWTN: Why She’s On A Book Tour, Her Assistant’s Amazing Conversion Story & More! On the set of EWTN Ukraine with EWTN President & CEO Michael P. Warsaw (center), Catholic Media Center Director Fr. 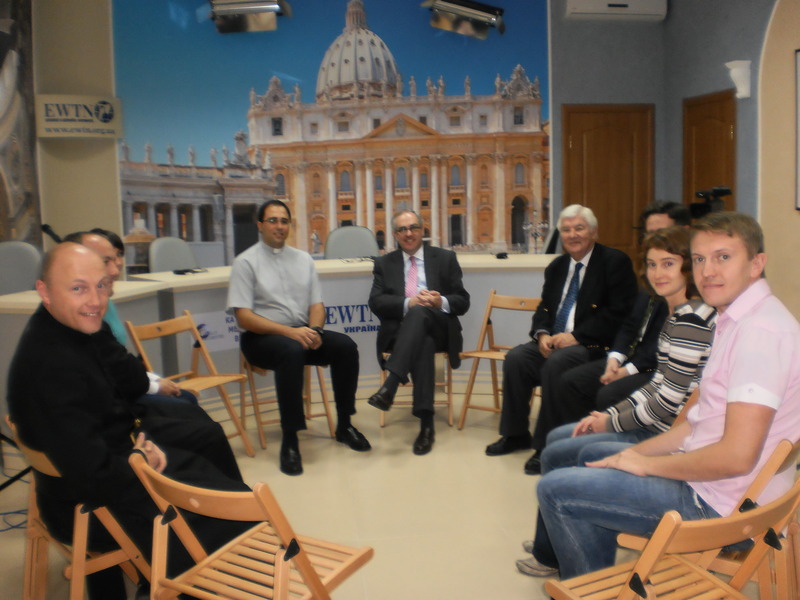 Diego Sáez Martin OMI (left of center), EWTN Regional Manager Ian Murray (right of center), and staff. EWTN President and Chief Executive Officer Michael P. Warsaw traveled to Ukraine last week for meetings about EWTN’s Ukrainian-language television channel. Michael arrived in Kiev the same day as Father Diego Sáez Martín OMI, the new Director of the Catholic Media Centre, where EWTN is broadcast. In fact, the two men were introduced to the staff of the Centre at the same time! The permanent staff consists of three priests and three religious sisters and four lay people. The rest of the staff are all volunteers. 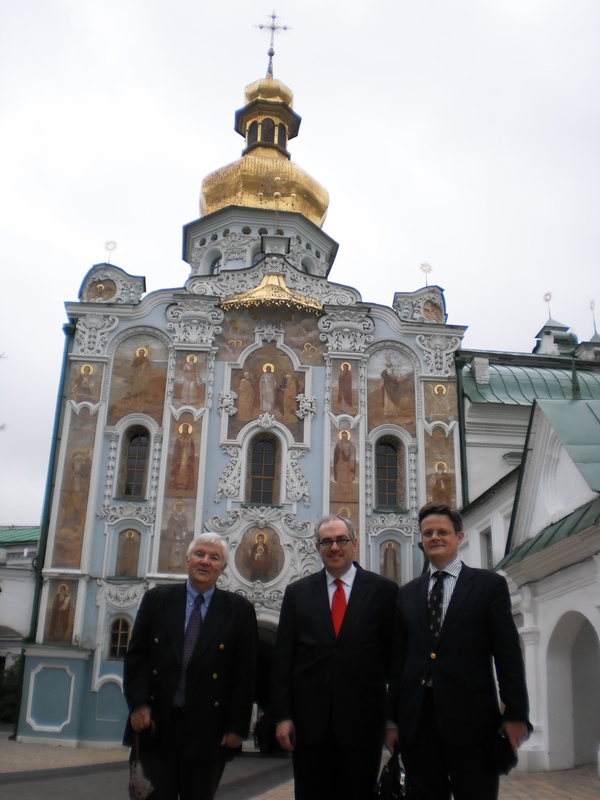 EWTN President & CEO Michael P. Warsaw looks over the facilities in Ukraine with Catholic Media Centre Director Fr. Diego Sáez Martin OMI. The Catholic Media Centre, which was launched in 2004 at the invitation of the head of the Roman Catholic Bishops Conference, is located in a church that is still under construction. EWTN Ukraine launched on Dec. 8, 2011. 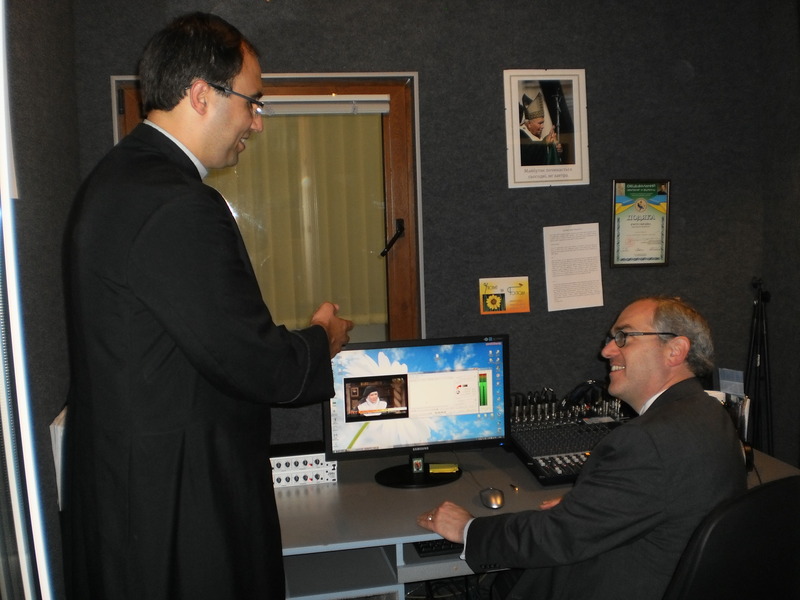 The Centre receives EWTN’s European feed via satellite, downlinks it, and provides Ukrainian translation. The channel is then sent via fiber optics to Volia, the leading Ukrainian cable television company. EWTN Ukraine now reaches 21 towns and cities. Believe it or not, the staff translates all of EWTN’s live shows and papal events into Ukrainian! To say everyone works extremely hard is an understatement. In fact, the three Oblate of Mary Immaculate priests often work 18 hours a day! On weekends, the priests preach about EWTN in the parishes. They are grateful beyond measure to EWTN for helping them bring the Ukrainian Church back to life. EWTN Regional Manager Ian Murray, EWTN President & CEO MIchael P. Warsaw and EWTN’s Regional Manager for Central and Eastern Europe. Although the number of Catholics in Ukraine is small – estimates range from 0.6% to 2% for the Latin Rite and 5.3% to 8% for the Greek Rite –Michael says the miracle is that the Church has survived at all. To understand why, you only have to hear the story of Father Pavlo Vyshkovskyy, Provincial Superior of the Oblates of Mary Immaculate in Ukraine. Father Pavlo founded the “media community” which does much of its work through the Catholic Media Centre, and also publishes a magazine and EWTN’s Ukrainian website, www.ewtn.org.ua. Father Pavlo was the first director of the Centre and, although he recently became the Superior of the Oblates of Mary Immaculate in Ukraine, he still tracks everything at the Centre on a daily basis. Michael shakes his head as he recalls this priest’s remarkable story. You may think this all happened in the distant past, but Michael said Fr. Pavlo is only 38-years-old. Michael had a chance to see – up close and personal – what happens when the citizens of a country lose the fundamental right to openly practice their religion. During the Soviet era, gorgeous cathedrals in Kiev were taken over by the government and turned into everything from tractor repair shops and stables to atheism museums and concert halls. Although the Soviet Union has fallen, these houses of worship in Kiev have not been returned to the diocese. Even today, the Diocese of Kiev has to purchase seats in its former churches every Sunday for the congregation. Meeting In the office of Archbishop Petro Malchuk OFM, Latin Rite Archbishop for the Diocese of Kiev-Zhytomyr, Ukraine. While in Ukraine, Michael had the opportunity to meet Archbishop Petro Malchuk OFM, Latin Rite Archbishop for the Diocese of Kiev-Zhytomyr. He is the first Catholic bishop allowed to reside in Kiev in 350 years! Archbishop Malchuk’s office is in the bell tower of the Cathedral. To reach it, one must ascend a rickety spiral staircase to a room with a desk, computer and a phone. The Bishop has no staff. Michael also had the opportunity to meet with His Beatitude Sviatoslav Shevchuk, Major Archbishop of the Ukrainian Greek Catholic Church. He normally resides in Kiev, but was in Lviv at the time of Michael’s visit. Unlike Kiev, which was almost totally destroyed during World War II, many of the beautiful churches in Lviv were not destroyed and are still maintained by the Ukrainian Greek Catholic Church. While that is a significant advantage, both the Latin Rite and the Eastern Rite Catholic Churches face the challenge of rebuilding relatively small congregations. 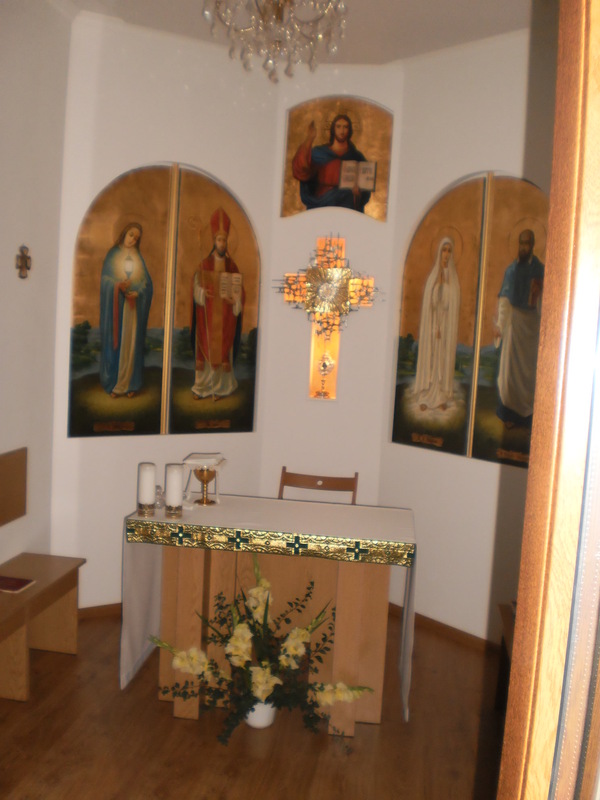 Mass is offered every day in a small but very beautiful chapel in the Catholic Media Centre, Ukraine. But how can the Church rebuild after such devastation? In the “I Love Jesus” DVD that Michael was given, Fr. Pavlo tells the story of his days as a young seminarian. He desperately wanted to meet Pope John Paul II. Fortunately, his order had a contest. The seminarian who learned the most about the Oblate of Mary Immaculate’s founder would be sent to Rome for the canonization. Fr. Pavlo won. Fr. Pavlo will have help. As Michael was told time and time again during his trip, EWTN is the primary method for spreading the Gospel in a country where many of the people who are left don’t even know who Jesus Christ is! What an honor – and what a responsibility! This entry was posted in Blog, Broadcast, Catholic View for Women, Christian, contest, EWTN, Jesus, Michael P. Warsaw, Ukraine, Uncategorized. Bookmark the permalink.